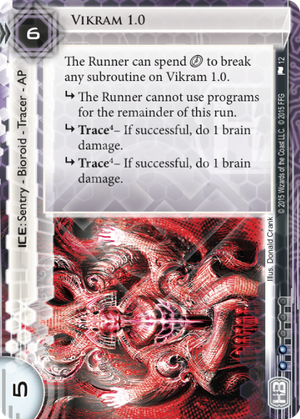 The Runner can spend click to break any subroutine on Vikram 1.0.
subroutine The Runner cannot use programs for the remainder of this run. subroutine Trace – If successful, do 1 brain damage. A massive, scary Bioroid sentry. This gives Ichi 1.0 a run for its money in terms of bang for the buck. For one more credit, you get one more strength and the same number of subs. In terms of what the subs do, you trade in the two trash and a throwaway sub in Ichi with a pseudo end the run sub and two strong brain damage traces. It's slightly more positional than Ichi. While you prefer Ichi in front of other ice, it can do its job alone. Vikram being at position 0 on a server make the first subroutine null and void for the most part. It WILL still stop the runner from doing things like running Deus X to stop a Snare! from hurting or trashing your stuff withh Imp. It does NOT stop Medium or Nerve Agent from working, or stop something from being a Keyhole run: only paid abilities are stopped. However, as an outside piece of ICE, it has an advantage over Ichi 1.0 in that all of its subroutines matter. Brain damage always hurts, and being unable to use programs encountering other ICE is usually a recipe for disaster for the runner. It doesn't have the game ending "surprise" power that Ichi can have when encountered clickless, but it can also do more to effectively keep the runner out in some desperate situations. All in all, though: they both do different things, and both do them well.